Since I have been so full of myself for tackling the cable knitted hat I decided that it was time to try stranded colorwork with TWO yarns! Yes, two yarns. CRAZY. First I found my inspiration at Exercise before knitting [which btw should be my mantra] not sure how I got there - maybe through Ravelry? But when I saw this - I fell in love and was so intimidated by the detail...there was no way - how do they do that?? Then I saw some of her other patterns; Winter Sunrise and XOXO... it became a mission to find out how knitters accomplish this two color work. I spent a couple of hours researching the internet, always coming back to KnittingHelp and doing a search on YouTube for stranded colorwork. 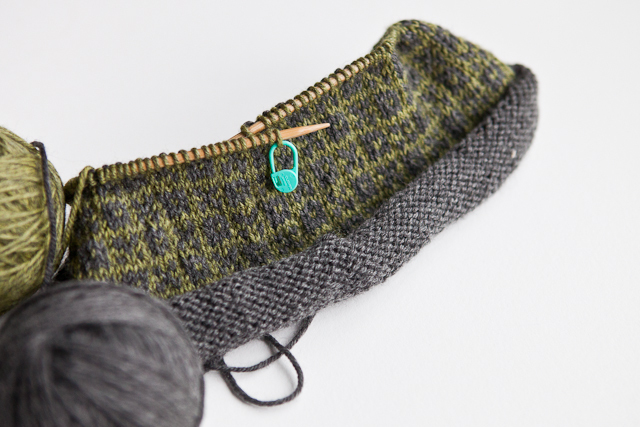 I found out that it's really just a stockinette stitch and you follow a chart using the colors. I can do this! I decided to start with the XOXO hat first - she provides the pattern for FREE! Went to my stash and found some gray and green Cascade 220 Superwash that Kirk had liked. Of course this would be for him - saving the Moody House for me. Plus what a great Valentine's gift - XOXO! 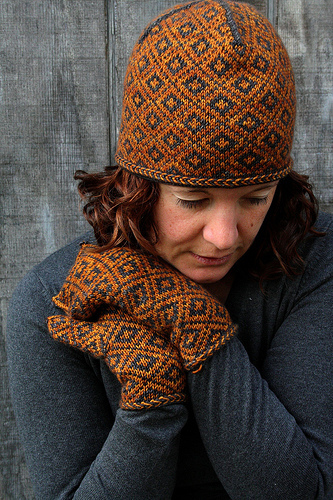 You won't believe how easy this hat has been to knit - WAY easier than the Koolhaas. Working in the second color was easy - I was freaked out at first but I just used the 'start to knit/work it in' method and everything worked out great. But I do have some mistakes. As you can see my ear warmer part [dk gray] was knitted the wrong way. I remember flipping my needles for some reason - can't remember. Well it was the wrong way. No plans to re-do, since you won't see it anyway. That part is going to be sewn to the inside of the hat. Just need to keep that in mind for the next time. The other part I would do differently is choose a contrasting color that isn't also 'heathered'. 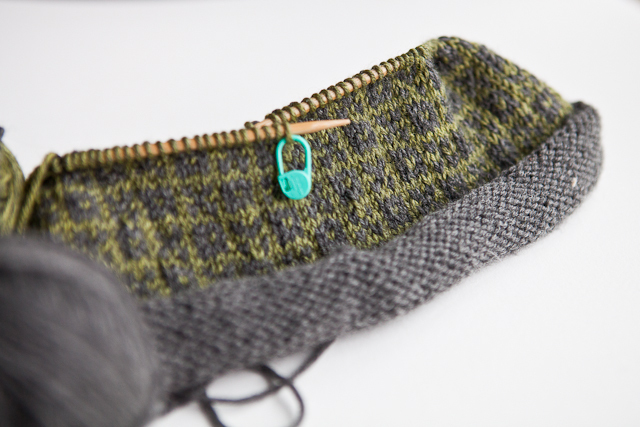 The green has just enough gray heather in it so the Xs and Os are sometimes not defined enough. The second color needs to be solid contrasting or bright enough to stand out. Will be posting updates as I work on this project! So cool! I just started my first stranded project, and I love it.